Just like last year our most popular tweet – by far – was about threats to train bike spaces. This time it was the HST trains coming soon to the Edinburgh/Glasgow to Aberdeen/Inverness lines. The 20 spaces originally promised were being whittled down to a miserable level – indeed lower than existing provision unless you were travelling end to end. Clicking the tweet takes you to a long trail of follow-up comments – and to background Spokes articles advising people what to do about the threats. [Latest – Spaces for intermediate stations have been increased from 2 to 4, still only the same as now, but could we believe be increased further if the government came up with a modest amount of cash]. There was also great interest in the police #OpClosePass project. 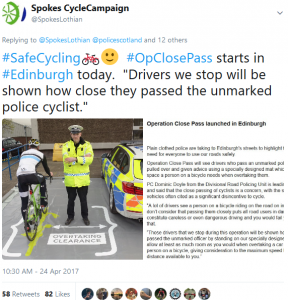 [Latest – Spokes is proud to have contributed to this in several ways, not least responding to a request for 15,000 copies of our Bike Alert leaflet, now used by the police when speaking to motorists]. The tweets illustrate the amazing range of activity we are involved in, the big issues that arise during a year, and the massive range of ongoing activity at many levels. Many of the tweets relate to Spokes campaigning efforts, some involving a great deal of time and work. As you can see above, there has been progress on most of the issues in our top tweets – big progress on some. So – our thanks to everyone who helps – most importantly if you email your councillors or MSPs, or help in similar big ways – but even just spreading info and ideas by retweets. Our tweets tend to concentrate on how you can help push the case for improved cycling conditions … advising of current opportunities, and when and how to act. Obviously we include pictures to grab attention and to illustrate points, but we rarely post something just for the sake of it. The number of RTs shown is at the time of writing – of course, some may change a little following this article! There are many ways of measuring the importance of individual tweets. The number of RTs is perhaps the most useful as a RT presumably means the reader wants to pass the information on to other people, whereas a ‘like’ has different meanings to different people. If you like this article, please RT our tweet about it! 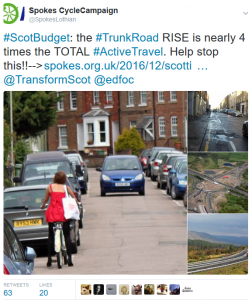 25 ScotGov doubles cycling investment £40->£80m p.a. 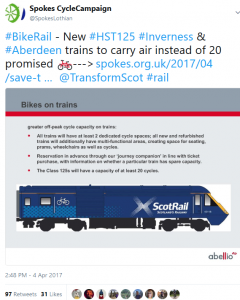 12 Bike/rail – dedicated bike/luggage coaches coming for rural lines? ?